The trail is open all year around, but it's not recommended from November to April. Avoid hiking the trail on windy days. Starting the Beautiful Bay Trail in the afternoon gives you an incredible experience. The sun will find its way occasionally through the old grown forest, you will find plenty of moss coped branches, walk over tree trunks, fallen trees, and find different kinds of mushrooms. The campground is serviced during summer only. Incredible hotels near Beautiful Bay Trail - Bere Point or in Canada? Check Booking.com (bookmark the link) since they guarantee the lowest rates! 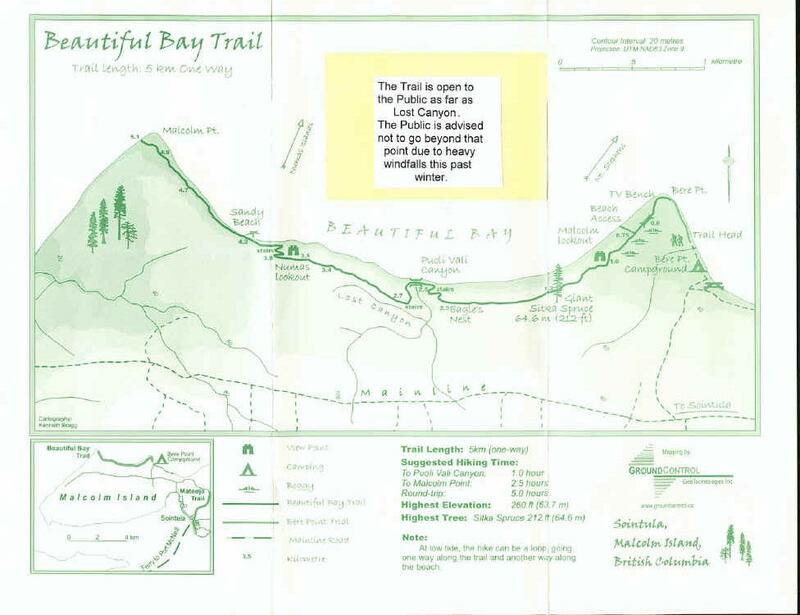 The most popular Trail on Malcolm Island is the Beautiful Bay Trail winding along a ridge above the Beautiful Bay. You get to the start from the east end of the Bere Point Regional Park. It leads along a stunning rainforest with some options to approach the beach. This together with the tide allows you to choose your own circular trail along this magnificent beach. Originally the trail goes all the way to Malcolm Point (5km, 3 miles) but currently, it is closed approx. half the way due to heavy windfalls at the Lost Canyon. You can leave the trail at Puoli Vali Canyon to the beach (Puoli Vali means "halfway along the journey" in Finnish. The canyon is also known for gold panning in the 1930s. You should plan at least half a day for this hike as you may be captured by the mystic rainforest and the stunning views of the beach. In the beginning, you will pass the viewing platform for Orcas which come to the Beautiful Bay to rub against the pebbles. Before you reach a higher elevation, you can use several turnouts down to the beach. The trail is marked with white stripes painted on the trees. It is easy to follow the footpath as long it's not foggy. Often you walk over weathered boardwalks and find your way through some dark leave covered spaces. But you need to take attention to your steps as the path is sometimes slippery and wet and seems to be not often maintained. Walking across all the roots and the winding path gives this trail also a mystic touch. "Malcolm Island is a place where humans go to create lasting memories." Situated off the northeast shore of Vancouver Island, you will find this hidden gem. It's relatively small in size (24 km (14 miles) long and 3 km (1.8 miles ) wide at its narrowest point. But Malcolm Island offers breath-taking scenery, tranquillity, great outdoor experiences, many wildlife viewing opportunities, and a fascinating history. If you want to leave the Island in summer, you should arrive early at the ferry terminal because the space for cars on the ferry is limited. To get the early morning ferry at 7:55 am it's almost impossible because many people park their car in the queue the day before. BC Ferries uses during the summer months a small ferry (~25 cars) compared to the wintertime when a larger ferry (~40 cars) is in use. This makes the situation even worse. You can find 11 possibilities to stay overnight on Malcolm Island including the Harmony Shores Campground and the Bere Point Regional Park. Most of them are guest houses, cottages, or B&B's. Bere Point Regional Park is about 6 km out of Sointula where the ferry arrives. You need to pass Solintula and drive a view kilometers on a gravel road. It offers 27 campsites with 11 offering a stunning view across Queen Charlotte Strait. It is directly located close to the Beautiful Beach which can be hiked via the Beautiful Beach Trail. The campsites don't provide power and offer only pit toilets. You need to bring adequate drinking water. The Campground is serviced during summer only. Public showers, washrooms, laundry facilities, and water are available at Rough Bay harbor which you pass when driving to Bere Point. Although the oceanfront sites cost 4 CAD more (2017), it's worth to get one of them. You should choose site 1-11 or A-E. There are several free picnic day use areas at Bere Point for public use if you cannot stay overnight. If you get hungry, don't miss the Burger Barn at the Marina, Open seasonal from Thursday to Monday. They offer fresh local seafood with Burgers with fries and homemade coleslaw. The Co-Op store is closed Sundays and Mondays, but you may get what you need at the Co-Op Gas Station which is open every day.